President Emmerson Mnangagwa and Alrosa CEO Sergey Ivanov. 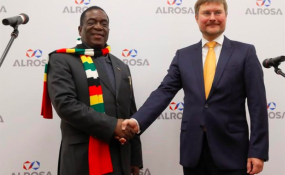 President Emmerson Mnangagwa received a boost Monday after Russian diamond giant Alrosa - the world's biggest gem producer - confirmed its return to Zimbabwe. The deal was reached Monday in talks between company executives and Mnangagwa who is in Moscow for a three-day state visit. Majority-owned by the Russian government, Alrosa started operations in Zimbabwe in 2013 but quit the country in 2016 after the Harare administration said it was kicked private companies out of the controversial Chiadzwa diamond fields. The decision was reversed by the government recently, resulting in Alrosa establishing a Zimbabwe subsidiary last December. Meanwhile, speaking after the talks with Mnangagwa Monday, the company's CEO Sergey Ivanov said, "I am confident we will be able to discuss in a few days the prospects for participation of our companies in the sphere of exploration and in the sphere of fields' development with a high degree of exploration maturity. "We are ready to share with our colleagues all the technology Alrosa possesses at present in respect to grading, preparation of diamonds for sale, and any know-how available with us, so that Zimbabwe is able to take the position the country had on the global diamond mining market for several years." Alrosa, Ivanov continued, is not going to focus on specific projects in Zimbabwe and plans to continue exploration of the region. "We want to examine what we have in the company, review geological data colleagues will be able to furnish to us. "Probably, appraisal will be needed in certain regions, to make narrower the zone for further consideration. "Already identified diamond pipes are present in Zimbabwe, conglomerate and placer deposits are also there." For his part, Mnangagwa said; "I'm sure that Alrosa is fully aware that we had closed the diamond industry in Zimbabwe from participation by foreign companies, but this policy was reversed in October last year, just about two months ago. "We now have opened a small window for foreign companies to participate in our industry as a result of realising our limited capacity both in terms of capital outlay as well as in the application of modern technology to maximise exploitation of our diamonds in Zimbabwe." Zimbabwe is home to rich diamond reserves, but mining in the country was linked to repression under former president Robert Mugabe.